Here’s how to delete all of the data from your old BlackBerry after you’ve upgraded to a new one, or whatever. Options > Security > General settings > Click on the Password field > Select Wipe Handheld. You will be asked to type in ‘blackberry’ in order for the procedure to commence. Within 2 minutes, your BlackBerry should be clean as a whistle. Ambient Devices, a company started by “former Massachussetts Institute of Technology students” (n.b., one might think graduates, but apparently CNET thinks they’re a too old for such nomenclature), has a series of devices that would look brilliant on any office worker’s desk.These have to be checked out. I want one. 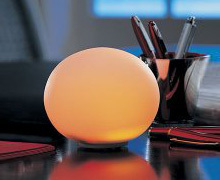 The products range from a device that can show pollen count, emails, and market activity in analog, to a glow-worm like ball that sits on your desk that changes colors according to a range of things you might want to track (e.g., traffic congestion).The devices aren’t cheap, but they will make an impression. Let’s see what the Apple’s Worldwide Developer’s Conference is all about. It begins today. Many of you are ready for a .Mac update. We’ll see what happens shortly. It’s not exactly a dharmic teaching, but the belief in “what goes around, comes around” has certainly visited Rambus today. Back in the day, Rambus, helped set the industry standards for RAM. When it did so, it had patents out for some of the technologies that were included in the standard. Everyone knew this in one way or another, but an FTC Administrative law judge in 2004 said it wasn’t the case, for whatever reason. Now the FTC has overturned that decision and Rambus faces penalties. End of story? Well, no. You may have heard about Rambus filing suits against memory chipmakers for, coincidently, using Rambus patents to meet the industry standards. And the lawsuits go on and on and on. Sounds like an SCO business plan! My home computer lost its second drive the other day. Over the past few weeks, the drive had been disappearing intermittently. Occasionally, I could get to get, but more and more upon clicking on the drive, an error message appeared saying the drive was “inaccessible. The parameter is incorrect.” When, the drive stopped appearing as a listed drive under My Computer, I knew my procrastination had run out of rope. I attached and reattached the cables to the drive, but to no avail. I took the drive out and put it in an enclosure. Nothing. Next, I put the drive back in the computer and brought up the device manager. I scanned for changes in the Device Manager. The computer slowed down, but, after a while, the Western Digital Caviar 80GB showed up. I tried a program called Test Disk that claims it can restore access to the drive. With Test Disk, I could see some of the data, but I could not copy it. I then tried the tools on Ultimate Boot CD. And I tried booting with Damn Small Linux in order to access the drive. Neither provided any access. Then, I got a copy of SpinRite. SpinRite is a data recovery and drive maintenance program written by Steve Gibson. It essentially goes to the bit level and reads and writes data to the drive in order to take care of errors at the physical level. It has a DOS interface and often times you can watch some of your data going by as the program scans your disk. I’d like to say SpinRite worked wonders, but it didn’t. On my 80GB dirve, SpinRite ran for about a week. (Yes, a week.) When the program takes this long, or predicts it will take this long, typically, according to experienced users, you are out of luck. When SpinRite was done, I rebooted my machine and the drive did not show up. Again, I scanned for changes in the Device Manager. When the drive showed up, it behaved similarly to before. I was frustrated and ready to throw in the towel. But, when I tried to access the drive in the command line, I was able to see the data and copy it over to a fresh drive, using the xcopy command. SpinRite worked thankfully, but I would only recommend it for experienced users. There is an incredible thread for the MSI K8NGM2-FID motherboard (Socket 939) in the forums at AndandTech started by renethx. Because of the comprehensiveness of this thread, I decided to buy the MSI motherboard instead of comparable models from ASUS and other manufacturers.